Economic recovery is slow as continued insecurity is curtailing private investment and consumer demand. Agricultural growth has been constrained by unfavorable weather conditions in the past years. The fiscal position has remained strong, driven by improvements in revenue performance, although the government remains heavily reliant on donor grants. Poverty has increased amid slow growth, security disruptions to services, and poor agricultural performance due to severe drought. Afghanistan faces numerous political challenges as it fights the insurgency. Presidential elections together with the country's district-council elections and parliamentary polls in Ghazni Province are due in September 2019. The ongoing direct peace talks between the United States and Taliban has increased hope for an intra-Afghan peace negotiations and peaceful settlement of the 40 years long war, but it has also added uncertainty and concerns among the Afghan people. The process gained some momentum after the Kabul Conference in February 2018 in which President Mohammad Ashraf Ghani made an unconditional offer for negotiations with Taliban, followed by a brief first-ever ceasefire in June. The Government of Afghanistan is hosting a Consultative Loya Jirga in late April 2019 to renew the road ma of peace. World Bank Group engagement pursues a programmatic approach to support the Afghanistan National Peace and Development Framework (ANPDF). Advisory work and operations focus on macro-fiscal policy and management; finance, private investments and jobs creation; public sector governance and anti-corruption; human capital development and service delivery; citizen engagement and social inclusion, urban development; and infrastructure, connectivity and sustainability. The security situation has worsened. Civilian casualties are at their highest since 2002, with an unprecedented level of conflict-induced displacement. Since 2007, the number of injuries and deaths has increased five-fold, and in 2016 and 2017, more than 1.1 million Afghans were internally displaced due to conflict. Between January – December 2018, the United Nations Assistance Mission for Afghanistan (UNAMA) recorded 3,804 civilian. UNAMA attributed 37 percent of civilian casualties to Taliban, 20 percent to Daesh, while unidentified anti-government elements have been called responsible for six percent of the civilian casualties. The return of almost 1.7 million documented and undocumented Afghan refugees, primarily from Pakistan and Iran during 2016-2017 remains a huge pressure on the country’s economy and institutions. Internal displacement and large-scale return within a difficult economic and security context poses risks to welfare, not only for the displaced, but also for host communities and the population at large, putting pressure on service delivery systems and increasing competition for already scarce public services and economic opportunities. The Government of Afghanistan continues to pursue its ambitious reform agenda. On 27–28 November 2018, the Geneva Conference on Afghanistan was co-hosted by the Government of the Islamic Republic of Afghanistan and the United Nations. Delegates from 61 countries and 35 international organizations, and representatives of civil society, the private sector and the media attended in the conference. Participants at the conference renewed their partnership and cooperation for Afghanistan’s peace, prosperity and self-reliance. The conference was held between two pledging conferences: the Brussels Conference on Afghanistan (2016) and the next pledging conference expected to be held in 2020. In October 2016, the government presented the Afghanistan National Peace and Development Framework (ANPDF) at the Brussels Conference on Afghanistan. At the conference, attended by representatives of around 70 countries and 30 international organizations, development aid of $3.8 billion per year was committed. In Afghanistan output growth has slowed to an estimated 1.0 percent in 2018, down from 2.7 percent in the previous year. The decline was because of: a severe drought that affected wheat production and livestock pasture and, heightened political uncertainty and election-related violence, which dampened business confidence. Despite the lower agriculture output, inflation remained moderate at 0.6 percent on average in 2018, due to lower regional food prices and appreciation of exchange rate against major trading partners. Poverty is estimated to have increased and deepened. The severe drought resulted in lower income for rural households and large internal displacement in the country. The rate of economic growth lagging population growth, leading to declining per capita incomes. The drought negatively impacted livelihoods of many of the 82 percent of the poor living in rural areas, including those reliant on poppy cultivation (poppy production declined by 30 percent). Reflecting widespread hardship, drought-induced displacement reached record levels of 298,000 individuals. Weaker exports and a moderate increase in imports have widened the trade deficit to around 35.9 percent of GDP in 2018. Nominal exports, after strong growth of 28 percent in 2017, declined by four percent in 2018, potentially reflecting a strengthening of the Afghani against trade partner currencies and economic disruption in important neighboring economies. Imports increased by 0.7 percent, led by a strong increase in vegetable imports. The current account narrowed, reflecting the widening trade deficit and declining grants. Aid flows almost entirely financed the trade deficit. Fiscal management remained strong. An overall fiscal surplus of around 0.7 percent of GDP was achieved in 2018. Despite slow growth, domestic revenues reached a record high of Afs 189.7 billion, an increase of 12 percent from 2017 levels. Strong revenue growth was supported by improved tax administration, with estimated arrears collection of Afs 10.5 billion and a surge in non-tax revenues. Budget execution increased from 83 percent in 2017 to 92 percent in 2018, with the development budget execution rate reaching 93 percent. Reflecting high levels of uncertainty, credit-to-the-private sector declined by four percent in 2018 and is now equal to just three percent of GDP. The credit intermediation function of the banking system has remained extremely weak, with private sector credit equal to just 12.8 percent of bank assets in 2018. Excess liquidity of banks reached 63 percent of total bank assets. The central bank has recently taken action to facilitate access to credit, including expanding the list of eligible collateral and the coverage of the Public Credit Registry. Few Afghans have access to productive or remunerative employment. A quarter of the labor force is unemployed, and 80 percent of employment is vulnerable and insecure, comprising self- or own account employment, day labor, or unpaid work. Almost three-quarters of the population are below the age of 30, and roughly 25 percent are between the ages of 15 and 30. This large youth cohort of approximately 8 million is entering the labor market with little education and few employment opportunities. A natural consequence of the poor security situation and limited development resources, job creation has been unable to keep up with population growth, and good jobs are few and far between. 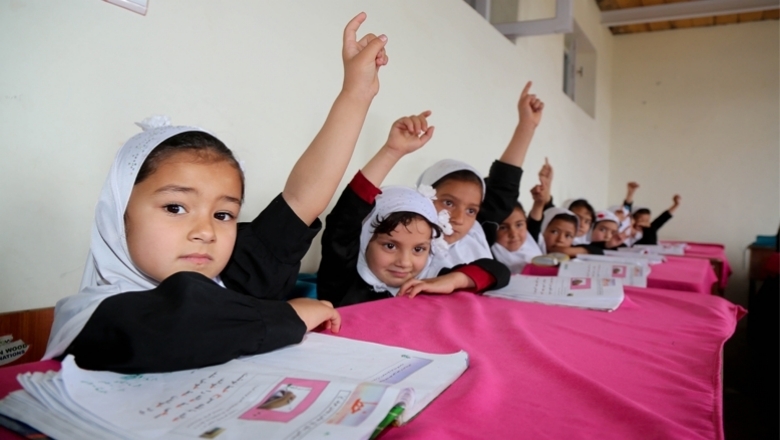 Though increasing over time, just over half (54 percent) of young Afghans are literate. Labor force participation rates of young Afghan women are particularly low due to higher rates of inactivity and unemployment. Young Afghans (age 15–24) have a high unemployment rate of 31 percent, while 42 percent are neither in employment, education, or training. Progress with education is threatened by the security situation. The net attendance rate in secondary education fell from 37 percent to 35 percent between 2013 and 2016, driven by declining attendance among girls. Growth in 2019 is expected to remain sluggish but slightly recover, largely due to improved weather conditions. Growth in the industry and service sectors will remain subdued amidst continued political uncertainty surrounding the upcoming presidential elections, discussions over continued international security support, and a potential peace agreement with the Taliban. Over the medium-term, growth is projected to gradually accelerate to around 3 percent by 2021, assuming a stable political transition following the presidential election and subsequent improvement in investor confidence. A slight fiscal deficit is expected in 2019. Revenue mobilization is expected to stall, reflecting: i) exhaustion of revenue potential from measures implemented in 2018, including amnesty programs; and ii) weakening customs revenues in the context of political instability and weakened governance. The current account is expected to gradually deteriorate over the medium-term, because of declining international grants. A substantial deficit in the range of 4-6 percent of GDP is expected by 2021-22. International reserves are expected to remain at comfortable levels (from the current level of over one year’s import cover down to less than 10 months’ import cover by 2021). The short-term growth outlook is subject to significant downside risks. Continued violence and political instability could further dampen investment and growth. Election-related disruptions to revenue collection and expenditure discipline could undermine fiscal management and confidence. Any rapid decline in international aid flows would drive difficult fiscal and external adjustments and undermine the capacity of government to maintain basic services. On the other hand, ongoing peace talks may unlock substantial investment and growth if they lead to a comprehensive and sustained improvement in security. Without accelerated reform and an improved security situation, growth is likely to remain slow with limited progress in reducing poverty from current very high levels. Reforms are required immediately to both improve general investment confidence and mobilize existing economic potential, especially in agriculture and extractives. Continued international assistance in security and development is critical to preserve development gains achieved over the last seventeen years. Clear commitment to sustained support from international partners would help to reduce current levels of uncertainty, supporting increased confidence and investment. Afghanistan became a member of the World Bank in 1955. Shortly after the Soviet invasion in 1979, World Bank operations were suspended, although the Bank continued to provide assistance to Afghans through its office in Pakistan. Prior to 1979, the World Bank provided 21 no-interest loans, known as ‘credits’, to Afghanistan across a wide range of areas, including education, roads, and agriculture. Of the original $230 million in credits approved by the International Development Association (IDA), the Bank’s concessionary lending arm, $83 million was disbursed and $147 million was subsequently canceled. Afghanistan repaid $9.2 million to IDA and was up-to-date on debt service payments until June 1992, when it stopped making payments. Operations resumed in May 2002 to help meet the immediate needs of the poorest people while assisting the government in developing the administrative systems required for longer-term nationwide development. Aid has since grown tremendously. To date, the World Bank has provided a total of over $4.4 billion for development and emergency reconstruction projects, and six budget support operations in Afghanistan. This support comprises over $4.04 billion in grants and $436.4 million in no-interest loans. As of March 2019, the Bank has 16 active IDA projects in Afghanistan with net commitment value of over $1.9 billion. The International Finance Corporation (IFC), the World Bank Group’s private sector development arm, continues to work with its investment and advisory services partners in Afghanistan. IFC’s current cumulative committed investment portfolio stands at over $150 million and its advisory services portfolio stands at $13.9 million. IFC’s investment portfolio includes investments in the telecommunication sector, agribusiness, and financial markets. The investment pipeline looks promising and includes investments in the power and education sectors. IFC’s advisory services program has been supporting the investment program in access to finance, strengthening horticulture export, access to renewable energy, corporate governance structure enhancement, and investment climate reform interventions. The World Bank Group’s Multilateral Investment Guarantee Agency (MIGA) has $116.5 million of gross exposure for two projects in dairy and cashmere production in Afghanistan. The Afghanistan Reconstruction Trust Fund (ARTF) was established in 2002 to provide a coordinated financing mechanism for the Government of Afghanistan’s budget and national investment projects. Since its inception, 34 donors have contributed over $11.4 billion to the ARTF, making it the largest single source of on-budget financing for Afghanistan’s development. The ARTF has a three-tier governance framework (Steering Committee, Management Committee, and Administrator), plus three working groups. This sound framework has enabled the ARTF to adapt to changing circumstances and development priorities with consistency and consensus. The World Bank is the Administrator of the trust fund. The Management Committee consists of the World Bank, Islamic Development Bank, Asian Development Bank, United Nations Development Programme, Ministry of Finance, and the United Nations Assistance Mission in Afghanistan as an observer. The World Bank Group’s assistance to Afghanistan will support the government’s strategic vision and goal to reduce poverty. The World Bank Group’s current engagement with Afghanistan is determined by the Country Partnership Framework (CPF), which is closely aligned with the government’s Afghanistan National Peace and Development Framework (ANPDF). The World Bank Group’s support to Afghanistan over 2017-2020 aims to help Afghanistan build strong and accountable institutions to deliver services to its citizens, and to encourage growth of the private sector. The CPF also aims at supporting economic growth that includes all members of society, with a focus on lagging areas, urban informal settlements, and people driven from their homes by conflict. Deepen social inclusion through improved human development outcomes and reduced vulnerability among the most underprivileged sections of society, including the large numbers of internally displaced persons and returnees. Over the CPF period the World Bank expects to provide $250-$300 million in grants annually to Afghanistan through the World Bank Group’s International Development Association, the fund for the poorest countries. Additionally, the Afghanistan Reconstruction Trust Fund could provide up to $800 million per year in grants, depending on donor commitments. The International Finance Corporation, the World Bank Group’s private sector arm, aims to expand from the current $54 million portfolio to about $80 million. The Multilateral Investment Guarantee Agency, the Bank Group’s political risk insurance arm, stands ready to provide support with a focus on finance, manufacturing, agribusiness, and infrastructure. Building Institutions: The Tackling Afghanistan’s Government HRM and Institutional Reforms (TAGHIR) is a new project that replaces the Capacity Building for Results Facility and will assist the Government of Afghanistan to deliver its key policy priorities through merit-based recruitment and administrative reforms in 16 line ministries. The project will support up to a total of 1,500 new civil service positions to enable the ministries to meet their objectives and deliver on their priorities. The Eshteghal Zaiee - Karmondena Project aims to strengthen the enabling environment for economic opportunities in cities where there is a high influx of displaced people. The project will support actions to increase returnees' access to civil documents, provide short-term employment opportunities, improve market enabling infrastructure, and support investor-friendly regulatory reforms. Education: The Higher Education Development Project (HEDP) aims to increase access to higher education in Afghanistan, as well as improve its quality and relevance. HEDP uses an Investment Project Financing instrument based on the Results-based Financing modality. Enrollment in key priority disciplines (those that contribute to economic and social development) has increased substantially from 64,200 at the project baseline to about 81,900 this year. The special focus on increasing female enrollment has also paid substantial dividends with female enrollment increasing from 11,400 to approximately 16,900 for the current academic year. The Skills Development Program revived two key institutions in Kabul: the National Institute of Management and Administration (NIMA) that prepares young professionals to acquire junior-level jobs in the public and private sectors; and the National Institute of Music that trains gifted young musicians, establishing a nurturing platform for music in the country. Under the Afghanistan Second Skills Development Program, 100 national occupational skills standards have been benchmarked to an international level with the support of an international certification agency, and corresponding curricula developed for 15 trades. The project is financing an academic partnership contract with Pune University in India to enable 20 faculty members from NIMA to undertake master’s degree courses. A series of memorandum of understanding is also being finalized with other host institutions in India to provide one-year diploma courses in specific trades to some 200 technical and vocational education and training (TVET) teachers selected through a competitive process. In addition, over 522 TVET graduates have been supported with scholarships through a voucher program, which facilitates further professional studies for meritorious students who have graduated from TVET institutes. Financial Sector: The Access to Finance Project aims to build institutional capacity to improve access to credit of micro, small, and medium enterprises. The Microfinance Investment Support Facility for Afghanistan (MISFA) has initiated a series of activities, in particular the scaling up of the Targeting the Ultra Poor (TUP) program. The TUP program has been completed in four provinces (Balkh, Kunar, Laghman, and Takhar) and is ongoing in two more provinces (Kabul and Kandahar). A project restructuring has been completed that extended the project closing date to June 30, 2021 to expand the TUP program to two more provinces (Parwan and Nangarhar) and to engage further on important topics, including access to agriculture finance and digital financial services. Health: Bringing most of the efforts in public health service delivery under one umbrella in Afghanistan, the Sehatmandi (Health) Project aims to increase the utilization and quality of health, nutrition, and family planning services across Afghanistan. The project supports implementation of a Basic Package of Health Services and an Essential Package of Hospital Services through contracting arrangements across the country. Sehatmandi also supports efforts to strengthen the capacity of the Ministry of Public Health at central and provincial levels to effectively carry out its stewardship functions. Health indicators saw an improvement with the support of the System Enhancement for Health Action in Transition Program, the precursor of the Sehatmandi Project. For example, the newborn mortality rate fell 32 percent from 53 to 36 per 1,000 live births from 2000 to 2015; the number of functioning health facilities increased from 496 in 2002 to more than 2,800 in 2018, while the proportion of facilities with female staff increased; and births attended by skilled health personnel among the lowest income quintile increased from 15.6 percent to 59 percent. Horticulture and Livestock: The ARTF supported the National Horticulture and Livestock Project to promote the adoption of improved technologies by target farmers in the horticultural sector and to support the livestock sector, with gradual rollout of farmer-centric agricultural services systems and investment support. The project has financed the establishment of 27,058 hectares (ha) of new pistachio and fruit orchards in 32 provinces. In addition, over 101,500 ha of existing orchards have been rehabilitated and some 132,000 kitchen gardening schemes established. The project has also supported construction of 13,00 small water harvesting structures, improving farmers’ resilience to weather changes by allowing harvest and storage of water during the rainy season and gradual release in the growing period based on crop needs. Over 1,500 raisin drying houses has been constructed on a cost-sharing basis to reduce post-harvest losses of grapes and improve the quality of raisins produced. Regarding livestock activities, NHLP continues to focus on key activities, including poultry production and animal health and extension services, while expanding work programs to other areas such as fishery and dairy. To date, the project has supported 172,000 livestock farmers (104,242 women and 68,722 men), clustering them into producers’ groups to benefit from animal production and health services. Irrigation: With over 85 percent of rural population relying on agriculture, irrigation remains a pressing need in rural Afghanistan. The Irrigation Restoration and Development Project (IRDP) envisages support to rehabilitate irrigation systems serving some 215,000 hectares of land and for the design of a limited number of small multi-purpose dams and related works, while establishing hydro-meteorological facilities and services. In the irrigation component, a total of 185 irrigation schemes has been rehabilitated, covering over 203,000 hectares of irrigation command area (compared to the end project target of 215,000 hectares and over 425,000 farmer households). In the small dam component, a pre-feasibility review of 22 small dams resulted in a feasibility study being conducted on the six best ranked dams in the northern river basin (which is not on international rivers). In the hydro-met component, installation of 127 hydrological stations and 56 snow and meteorological stations located in various locations on the five river basins in the country is ongoing. In addition, 40 cableway stations for flow measurement at selected hydrology stations have been installed, and the installation of 30 cableways are ongoing. The Afghanistan On-Farm Water Management Project works to improve agricultural productivity in project areas by enhancing the efficiency of water use. Over 500 km of irrigation canals (186 km planned) serving around 58,000 hectares (ha) of land have been rehabilitated and 614 irrigation associations (500 planned) established. Land-leveling activities have also started commercially, with over 700 ha of land laser-leveled in three provinces. The Farmer Call Center is fully functional, providing technical advice to nearly 13, 000 farmers and herders to date. Rural Development: Improving access to basic services and facilities through secondary and tertiary roads, the Afghanistan Rural Access Project will increase the number of people living within two kilometers (km) of feeder roads and reduce travel time to essential services. To date, more than 3,270 km of rural roads and related drainage structures have been upgraded or rehabilitated through four projects under these programs financed through IDA, ARTF, and other funds. Rural Enterprise: The Women's Economic Empowerment–Rural Development Project is a follow-on project to the Afghanistan Rural Enterprise Development Project (AREDP) that aims to increase social and economic empowerment of poor rural women in selected communities. It will engage in 76 districts and 5,000 villages in all 34 provinces across Afghanistan. The project has begun mobilization through new Community Development Councils in the five provinces previously covered under AREDP. Around 440 self-help groups (SHGs) for women are receiving their initial training. The project continues to support business development in the areas previously covered by Afghanistan Rural Enterprise Development Program. Social Service Delivery: The Citizens’ Charter Afghanistan Project (Citizens’ Charter) is the successor to the highly successful National Solidarity Programme (NSP), which introduced a community-driven development approach toward rural infrastructure and service delivery and reached about 35,000 communities over 14 years. The Citizens’ Charter supports the first phase of the Government of Afghanistan’s 10-year Citizens’ Charter National Program and will target one-third of the country. The Citizens’ Charter aims to improve the delivery of core infrastructure and social services to participating communities through strengthened Community Development Councils (CDCs). These services are part of a minimum service standards package that the government is committed to delivering to the citizens of Afghanistan. In rural areas: Over 8,400 community profiles (CPs) completed; more than 8,150 new CDCs elected; over 6,900 Community Development Plans (CDPs) completed; and more than 5,700 sub-project proposals prepared. In urban areas: Implementation has been rolled out in over 666 communities. A total of 633 CPs completed; 633 CDCs elected; 592 CDPs completed; and 509 sub-project proposals approved. Results expected under the first phase of the Citizens’ Charter include: (i) 10 million Afghans reached; (ii) 3.4 million people gaining access to clean drinking water; (iii) improvements to quality of service delivery in health, education, rural roads, and electrification; (iv) increase in citizen satisfaction and trust in government; and (v) 35 percent return on investment for infrastructure projects. Urban Development: The Kabul Municipal Development Program increases access to basic urban services in certain residential areas of Kabul City. Over 1.36 million people (about 73 percent women and children) have benefited from the construction of about 486 kilometers of neighborhood roads, 590 kilometers of community drains, and 36 kilometers trunk roads. The Kabul Urban Transport Efficiency Improvement Project aims to improve road conditions and traffic flow on select corridors of Kabul city. To date, nine civil works contracts, totaling 30 kilometers of roadway, have been completed and the roads opened to traffic. Find out what the Bank Group's branches are doing in Afghanistan.